Having a good CV is more important than ever. ‘Good’, however, doesn’t mean that your CV must contain page after page of qualifications, and comprehensive details of an outstanding career. A good CV is a document that catches the attention of an employer by following certain rules. The following checklist helps you create a good CV. Tick the circles on the right when you’ve completed each part. One of the tricks to writing a good CV is to check it – and re-check it – before sending it off. So the first thing you need is some raw material to check. If you already have a CV, read it through and make sure it’s up to date. If you don’t have one, write one now. The next stage can be straightforward or a real challenge – it all depends on how much you’ve written. Always remember that the average employer will usually have a pile of CVs to wade through, and little time in which to do so. Ideally, then, your CV should be no longer than two sides of A4. It’s possible, of course, that you may have so many qualifications, and so much experience, that your CV extends well beyond two sides. If you can’t avoid this, you may want to submit two CVs. One should be a two-sided version, and the other a more comprehensive document. For the purposes of this exercise, write the shorter document. You've doubtless written your CV on word processing software. It’s therefore relatively easy to introduce a range of fonts, headlines, and layouts. 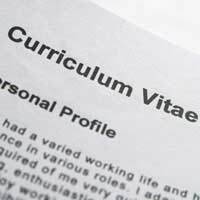 Don’t be tempted, however, to dress up your CV with a mixture of formats and styles. Keep to one font that’s easy on the eye – Arial, for example. Also, for the bulk of your text, use one font size. Ten or twelve is usually best. For headings, switch to bold, or underline. Apply an appropriate font style and size to your CV now. If you find that you’ve increased the font size, and you now have more than two sides of A4, revise your text. Your CV is taking shape. The next thing to do is bear in mind the job or jobs you’re applying for, and check that the CV content is relevant and highlights your appropriate skills. In other words, as far as you can, show an employer that you have the abilities, experience, and attitude that he or she wants. If you’re applying for a sales job with on target earnings, for instance, and you’ve done such work before, demonstrate what you’ve achieved with facts and figures. If you’re applying for a range of related jobs that have slightly different requirements, adjust your CV for each application. This is hard work, but it increases your chances of success. You now need to ensure your writing style doesn’t let you down. First test your CV against the spelling and grammar checker on your word processing software. Then consider your style. Your final task is to read your CV aloud. You don’t need to do this in front of anyone else - you can read your CV in private. The point is that reading aloud will help you uncover any problems with the text or omissions. Furthermore, if your CV sounds good, it will probably read well for an employer. You therefore increase your chances of obtaining the job you want. The above process takes a while, and you may do well to spread the work over a few days. The job market is competitive, however, and time spent creating a good CV will boost your career.